Remove all the good meat from the carcass, wrap well and set aside in the refrigerator. Then, break up the bones and the turkey frame (carcass) into pieces small enough to fit into your crock pot. Be sure you’re using at least a 4 or 5 quart crock pot. Cover the turkey bones with cold water, about 3 quarts should do it, depending on the bird and the size of your crock pot. Just try to cover the turkey completely. Now, wash and cut the celery into big chunks, including the leaves, and throw in the crock pot. Scrub the onion with a brush under running water to remove all dirt, especially in the root. Yes, leave the skin on but be sure the root is clean and all dry or loose skin is removed. (Cut the root off if you’re not comfortable with this.) Then cut the onion into quarters and put that in the crock pot. Add the rest of the ingredients, put the cover on the crock pot and turn it to LOW setting. Let the turkey stock cook like that on LOW all day, but if you can, try to leave it for a full 24 hours… the longer the better. Don’t peek! Every time you lift the lid it takes a long time to get simmering again. After you’ve let it simmer in the crock pot for as long as possible, cool a little and dig out as many bones and stuff as possible with a slotted spoon. Then lift out the crock pot insert and pour through a strainer or colander into a clean soup pot. Discard everything you strained out. If you’re saving the stock for another day, cool the stock quickly by putting the strained stock in the freezer for at least 30 minutes. It can then be moved to the refrigerator. Simmer for about 15 minutes. Now taste for salt and pepper and add what you like. Add about 1 cup of pasta if you like now and let simmer until the pasta is just getting tender. Then add some diced turkey and keep simmering until the turkey is hot and the pasta is cooked thoroughly. 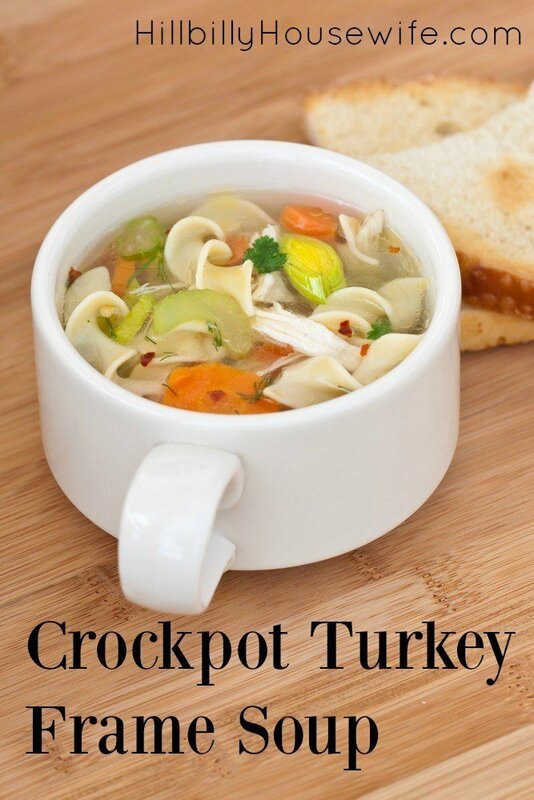 This crock pot turkey stock recipe will make about 3 or 4 quarts of soup and will freeze very well. Ready to learn more about crockpot cooking? Get my Crockpot Cooking Made Simple ebook today and find out how you can work this into your meal plan, how to choose a good crockpot and most importantly how to convert your favorite recipes to work in a slow cooker.